Last year's summer goal was pretty modest - to keep my flowers alive. This year's task is a little more daunting - lose 15 lbs. I don't know how I'm supposed to accomplish this as long as I'm hoovering up the kids' mac-n-cheese. Maybe if they inserted some sort of electrical charge into IPA bottles. But I'm working out quite a bit and preparing my own meals, so that should count for something. Then finding the time to do it right becomes the problem. So after a pair of soccer games and a 550-piece jigsaw puzzle (the weekend family project), you might have spotted a lone downtown Savannah warrior in his gym shorts around 10 PM grilling out on the side porch. 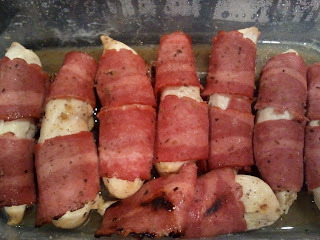 The result was "Spring Chicken," garlic lime chicken tenders wrapped in turkey bacon. Throw in some chives and crushed black pepper and it's a taste explosion. The idea is to make a bunch, and not just for now. Voila, zero-carb snacks and meals for the rest of the week. Pop in the microwave for :45 or eat cold. Either way it beats mac-n-cheese & and IPA.